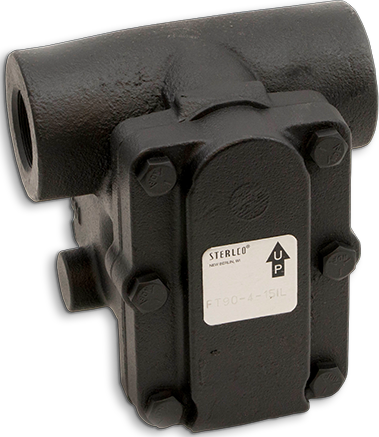 The Sterlco® In-Line Float & Thermostatic Traps (Model FT-90) are designed for all types of low pressure or vacuum steam heating systems and steam process equipment. Typical applications include: unit heaters, space heaters, water heaters, pressing machines, low pressure mains and risers, and replacement of inefficient inverted bucket traps. In-line float and thermostatic traps are especially well suited for apartments, hospitals, office buildings, and schools or wherever quiet operation is necessary. The opening and closing of the valve is caused by changes in the condensate level within the trap shell. When the water level drops, the weight of the float closes the valve. As condensate enters the trap, the float rises and opens the valve, allowing the condensate to be discharged. The float is designed to provide sufficient buoyancy to overcome the differential pressure across the valve. The internal float and valve configuration is such that the condensate level is always above the valve, creating a continuous water seal at the seat. Air and other gases are freely discharged as they reach the trap through the air vent. The calibrated thermostatic element will close the air vent immediately when the temperature surrounding the element reaches saturated steam temperature. Sterlco® In-Line Float and Thermostatic Traps are compact, of rugged design, with easy access to all interior parts. The body is cast with in-line pipe connections for simple straight through pipe hook-ups. The air vent valve, seat, and the complete valve mechanism are manufactured from stainless steel. The repair kit consists of a complete factory assembled head which simply bolts on to the body for ease of repair. No pipe connections need to be broken. Why Choose FT-90 Float and Thermostatic Steam Trap?